I made this cake for my sister’s birthday last week. As far as sisters go, my sister and I are as different as night and day. We don’t look alike, with the exception that we both share freckles. Growing up, I would be pale from staying in and reading books while she would be as tan as can be from playing outside. She loves the color black while I love white. She is loud and I am quiet. She prefers vegetables, while I prefer steak. She likes things simple and casual while I cannot get enough frills and bows. She favors pants in comparison to my preference to dresses. She is also not partial to desserts whereas I cannot live without them (as evidenced by this blog). I always tell people that whatever she is good at, I lack it and whatever I am good at, she lacks it. I love creating cakes and I look forward to baking one for all of my family members on their special day. But my sister does not like cake. HOW?! As someone whose life (or a good part of their life) revolves around frosting, and sugar and flour, it is hard to understand someone who does not like cake. So every year on her birthday, I resort to an ice cream cake. Because let’s face it, who doesn’t like ice cream? Tiramisu was one of my least favorite desserts because I used to rarely drink coffee. If anything, I loved it for the mascarpone cream. (Ah, mascarpone cream… everything you touch becomes a magical milky confection.) But ever since I gave up diet coke, I’ve been leaning towards coffee for my caffeine fix and I’ve managed to fall in love with the bitter brew. My sister’s preferred choice of drink has always been coffee, so tiramisu was a no-brainer when it came to a flavor choice. I have to say, this cake ranks as one of the best cakes to come out of my kitchen. 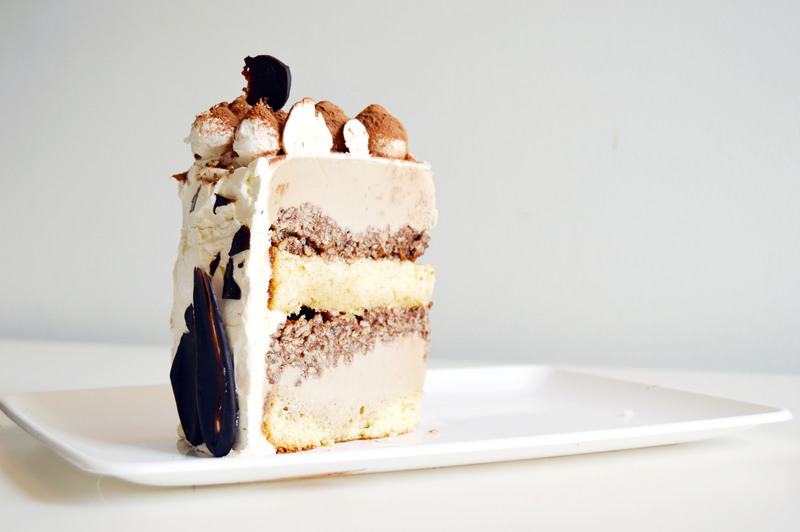 It features layers of coffee ice cream sandwiched between coffee syrup soaked sponge cake, chocolate almond crispies (!!! 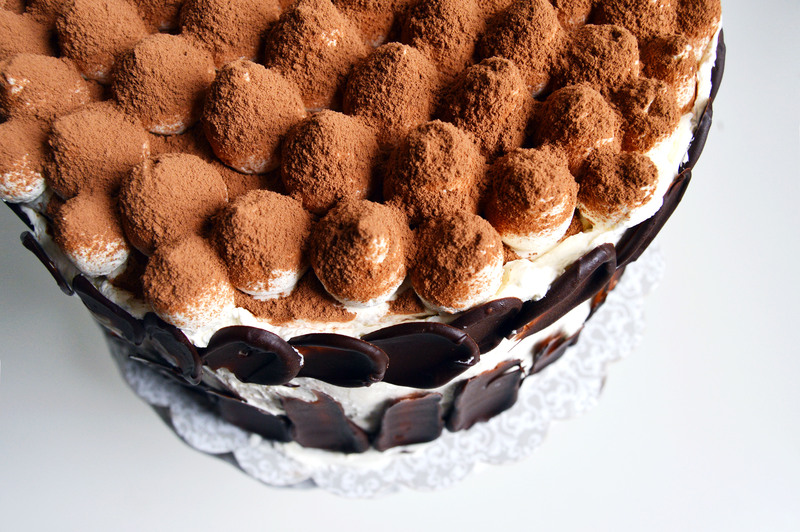 ), and is covered by a blanket of mascarpone whipped cream and adorned with dark chocolate accents and cocoa powder. I know. It sounds like it is too much work and it is true that there are many components to the cake. However, each part is simple to make! I always use high quality ice cream when it comes to ice cream cakes. It is important to have the lower air content so that the ice cream stays firmer, longer. I used Haagen-Dazs in mine. The sponge cake is a standard sponge cake that is divided in half. The coffee syrup is nothing more than a mix of sugar and dark brewed coffee. The chocolate almond crispies provide a crunch and a textural contrast to the smooth ice cream and cake. To make it, you simply stir chocolate almond spread with Rice Krispies cereal until it is evenly coated. The mascarpone whipped cream is a mix of vanilla extract, powdered sugar, mascarpone, and cool whip. I am not a fan of cool whip, but when it comes to ice cream cakes, I think it is superior in terms of spreadability and stability. To make the chocolate accents, simply melt some chocolate and using a small offset spatula, drag a dollop of chocolate over parchment paper and repeat until you have as many pieces as you need. They will not all look uniform, but I think that’s what makes it look slightly “rustic”. Line two 8-inch cake pans that are 3 inches deep with a double layer of plastic wrap that overhangs over the cake pan. Layer 28 oz. of coffee ice cream over the cake base, smooth so that the coffee base is as smooth as you can get it. Place pan in freezer for about 10 minutes. Meanwhile, make the chocolate almond crispies. Get half of the chocolate almond crispies and layer it over the ice cream, flattening it with an offset spatula to make it as flat, even and smooth as possible. Wrap the overhanging plastic wrap over the cake pan and place in freezer until completely frozen, preferably overnight. In the second lined cake pan, smooth 28 oz. of coffee ice cream with offset spatula evenly. Chill in freezer for 10 minutes. Layer the remaining chocolate almond crispies over the coffee ice cream. Place the second half of the sponge cake and brush liberally with coffee simple syrup. On a cake board you are planning to serve, carefully unmold the first cake pan you put together by lifting the plastic wrap off of the pan and unwrapping it completely. Take the second cake pan and unmold it, and place on top of the first cake pan layer with the sponge cake layer facing downwards. Apply pressure to fuse the two layers together. Place in freezer to harden for about 20-30 minutes. 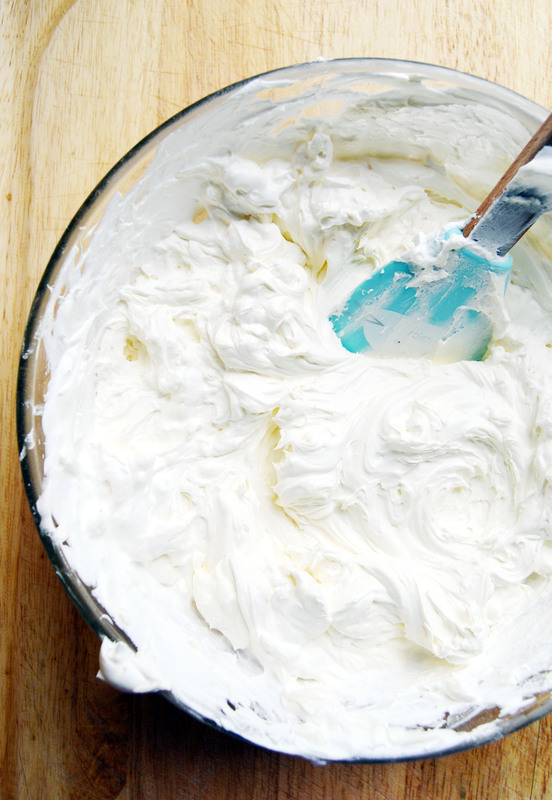 Meanwhile, make the whipped mascarpone cream. Remove frozen cake from freezer and frost the outside of the cake with ¾ of the whipped mascarpone cream. Place cake back in the freezer and put the remaining whipped mascarpone cream in a piping bag with a plain large round tip. Remove cake from freezer and use the piping bag to place decorative dollops of cream over the top of the cake by making even vertical rows of cream. Using a mesh strainer, liberally dust the top of the cake with cocoa powder. The cocoa powder will dust the surface of the cake board too, carefully use a wet paper towel to clean the cake board off. Place cake back in the freezer. While cake is freezing, make decorative chocolate pieces. Using a small offset spatula, drag dollops of dark chocolate to create a streak. Use larger dollops for the bottom and smaller dollops for the top. Place in refrigerator to set for 5-10 minutes. When set, remove the cake from the freezer and decorate the bottom of the cake with the longer chocolate pieces and the top of the cake with the smaller chocolate pieces. Preheat oven to 350˚F and grease the inside of an 8 inch baking pan with nonstick spray. In a small bowl, sift together flour and cornstarch. In the bowl of a standing mixer fitted with the whisk attachment, beat the egg yolks, vanilla extract, and ½ c. sugar on high until thick and pale. Thoroughly wash and dry mixing bowl and whisk attachment. 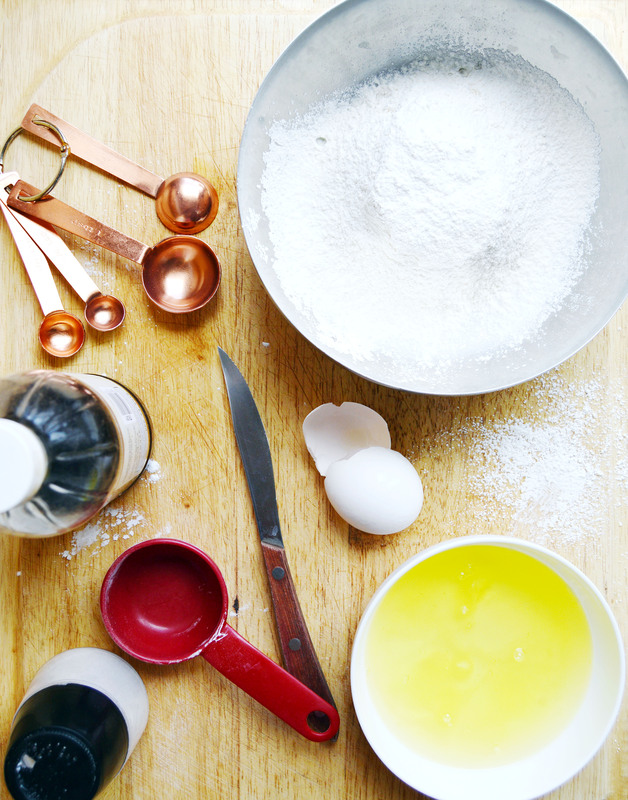 In a clean bowl of a standing mixer fitted with the whisk attachment, beat egg whites and salt until soft peaks form. Slowly incorporate the remaining ¼ c. of sugar into the egg whites and mix until whites are stiff and glossy. Fold egg whites into the egg yolk mixture in three additions. Bake 30-40 minutes or until a cake tester inserted into the center of the cake comes out clean. Cool cake on a wire rack until ready for use. Heat coffee and sugar together until sugar is completely dissolved. Cool until ready for use. Heat chocolate almond spread until easily pourable. In a large bowl, mix chocolate almond spread and cereal until cereal is evenly coated. Cool mixture until ready for use. In a large bowl, whip Cool Whip and half of mascarpone cheese until smooth with an electric hand mixer. Add the remaining half of the Cool Whip and mix until incorporated. Do not over whip. Add powdered sugar and vanilla extract and whip until homogeneous. * Vanilla Sponge Cake recipe from Martha Stewart. 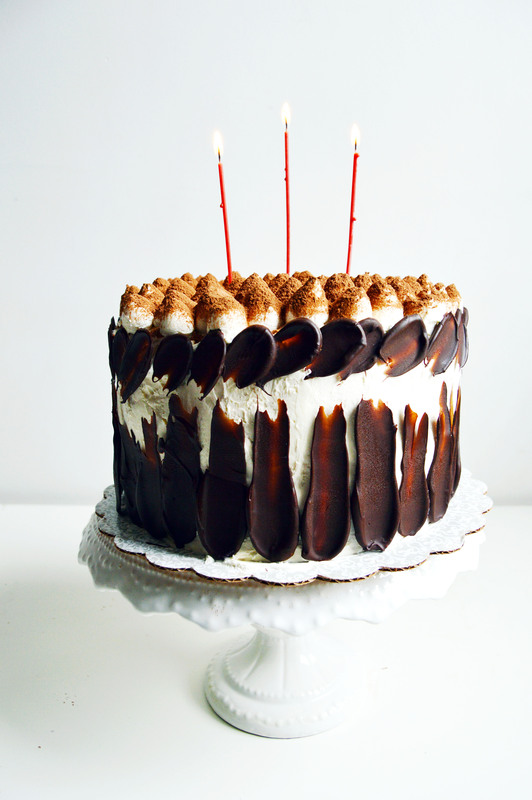 This entry was posted in Birthdays, Cakes, Chocolate, Coffee, Desserts, Holidays, Ice Cream, Vanilla and tagged birthday, Cake, cakes, chocolate, coffee, Desserts, Holidays, Ice Cream, tiramisu, vanilla. Bookmark the permalink. wow you are amazing !! this looks flawlessly delicious !! Happy Baking !! Your entire blog is fantastic. 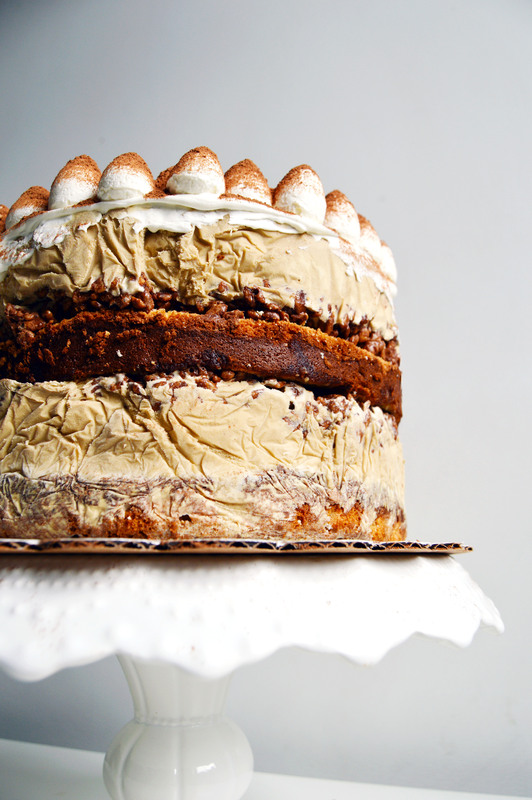 This cake is beyond words — I love the outer detailing with the chocolate! This sounds and looks amazing. A beautiful cake for a special person’s birthday! Hi i have made this but the choc crispy bit made it really hard to slice and eat also i used nuttella instead as i couldnt find the almond spread here was it hard for you to slice it? Hi, I’m sorry to hear it was hard to eat! It does take a little elbow grease to slice through it but it shouldn’t be hard to eat. It may be that the almond butter spread has a higher fat content than Nutella, making it less hard to eat.